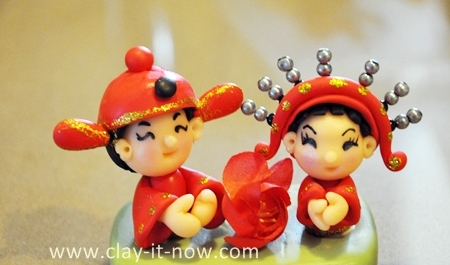 We decided to share our mini Chinese bride & groom figurine tutorial now. We received emails from some of you asking us about it and yeah...we won't delay it any longer. Air dry clay in red, black, and skin color. You can make your own clay with our modeling clay recipes or buy the air dry polymer clay that will dry hard. Gold glitter glue or paint. Silver bead and jewelry pins. How to make the body of the bride and groom in 4 steps? Roll your red clay to 2 cone shapse for the body with height about 1 inch or to your preference. Roll 4 cone shapes for the sleeves, flatten it, flare the base and make a shallow hollow where you will insert the hand in the next step. 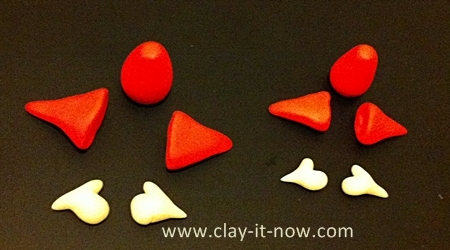 Roll your skin color clay to 4 small teardrop shapes, flatten it and cut it a little bit to create the thumb. Like my other mini figurines, make the head from skin color clay, draw the facial expression including eyes, eye brows and mouth. Use your black color clay to make the hair. Make the bride and groom's head accessories. For the bride: first of all make the head scarf with red clay. Roll the clay to a pipe shape, flatten it and wrap around the head. Push the end of the scarf to the center of the head to cover the whole head. Roll spaghetti shape clay, sharpen both ends of the spaghetti and curl it up. Paste this to the top part of the head. Insert the silver beads to jewelry pins, make as set of 7 pins. Arrange the beads behind the red spaghetti shape and push it in to the head. For the groom, you can cover the hair with red clay and add accessories to the hat. Finally decorate the head cover and sleeve with gold glitter glue or paint. That's it! Our mini Chinese bride and groom figurine is done. Please feel free to contact us if you have question or comment.